Most of my childhood vacations involved car trips around my home state, exploring the varied and beautiful landscapes that California has to offer. Unlike the traditional cactus specked dustscapes we think of when we hear the word desert, the high desert is a rocky, high elevation terrain covered in tenacious scrub and twisted trees. At night it gets very cool, even in summer. High Desert, the sweater, is a laceweight cardigan that you can wear when the sun goes down or when summer AC becomes overpowering. 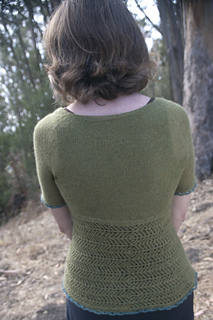 Light and airy in soft alpaca yarn, High Desert is fun to knit and easy to wear.